Nick Massie of PaleoNick.com brings us a decadent spin on traditional lasagna for a real Italian treat. Onions, garlic and basil are essential to developing a flavorful sauce. Some ground red chili is also recommended if you like a bit of spice. To make the squash “noodles,” Massie has some tips for slicing your butternut squash safely. “I’m going to show you—probably the hardest part about making this—and that’s going to be cutting this squash into lasagna-type strips,” he says. When it’s time to assemble your lasagna, put the dish together the good old-fashioned way—create layer after layer of squash noodles and hearty meat sauce. Pop it in the oven and 60-90 minutes later you’ll have eight three-block meals. 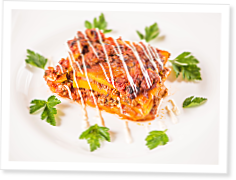 To download the recipe for butternut squash lasagna, click here. Video by Nick Massie and Jesse Kahle. Additional reading: Pot of Gold Soup by Shirley Brown and Alyssa Dazet, published March 19, 2013. Add some Asian flare to your meal plan with sesame chicken and broccoli, dubbed “world’s greatest five-block meal” by Nick Massie of PaleoNick.com.